The following is a guest post by Carlos Martinez III, a program support assistant in the Library of Congress Office of Strategic Initiatives and a recent graduate of the Catholic University of America’s Library and Information Science Masters Program. Digital technologies have become an integral part of everyday life, influencing and changing the way information is searched, retrieved, accessed and preserved. Over the past decade, there has been a major shift in the types and formats of information resources people seek, leading to changes in the way new library and information science professionals prepare for the current marketplace. This shift has manifested itself by creating opportunities in information technology roles and positions, such as digital archivists, repository librarians and metadata specialists versus more traditional roles of reference or cataloging librarians. Given this shift, I have often contemplated about the critical skills library and information science professionals need to obtain today – in graduate school and the professional arena. As a recent graduate and based on my recent work experience at the Library of Congress, I hope to shed some light on what having a “modern” library job entails, offer some thoughts on the types of skills I have concluded are necessary for librarians in today’s information environment, and offer some advice to emerging professionals. Even with recent discussion on the gaps that exist among professionals in the workplace, “library science” coursework is critical to understanding the profession as a whole. The traditional skills of librarianship, like cataloging and reference services, are still vital to the profession. For example, the information that is accessed via search engines was built on taxonomies and controlled vocabularies; mainstays of librarianship. During my master’s coursework, I took introductory and advanced courses in cataloging and classification. The theoretical concepts and practices taught in these courses are highly applicable to describe information at different levels of granularity for access. The digital age has also affected acquisition and collection development policies in libraries. Librarians must now consider how to effectively manage digital information resources, while maintaining physical collections. Taking collection management or development courses will prepare one to think critically about how to apply the theoretical principles within your library or information center. In one of my classes we discussed the importance of updating collection development policies to provide access to digital information resources. Acquiring and providing access to electronic materials for patrons both on and offsite is a critical component of maintaining a useful collection. All that said about theoretical coursework, it’s critical to take courses related to information system design and analysis. In light of previous discussions on this blog, it would be useful for new librarians to understand data as collections and for example, have the ability to manipulate and manage large data sets. A lot of the work that I do at the Library of Congress involves metadata remediation, data management and data migration. The courses that I feel prepared me most for this work were database management and programming for web applications. These courses offered a solid introduction into managing data in a relational database, and writing code for applications to create and access data. Without a doubt, the work that librarians perform has been changing as access to free digital information becomes more prevalent. It is important to pursue a curriculum that allows you to be comfortable providing user support, reference services, reader advisory, and the myriad of skills associated with librarianship in a variety of formats. The best way to earn this experience is through an internship or a practicum. 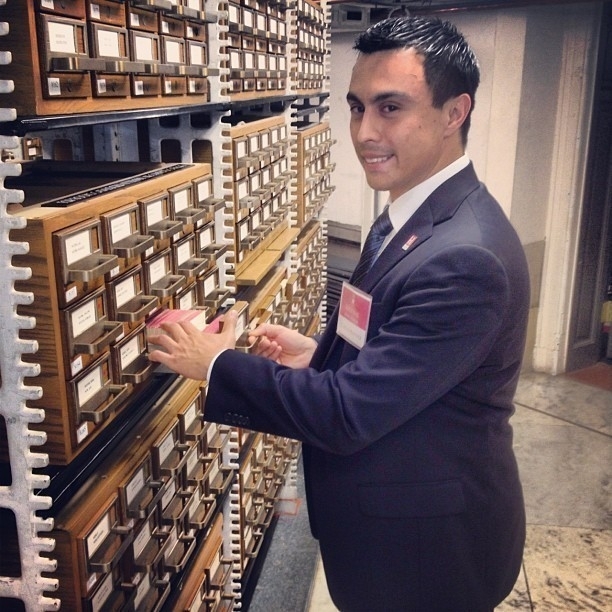 I started a second HACU internship at the Library of Congress Repository Development Center of the Office of Strategic Initiatives. Being a member of the RDC challenged me to learn about some of the problems librarians are facing with preserving digital information resources, such as digital content transfer and media degradation. I had the opportunity to meet with several stakeholders within the Library, and help develop a set of data elements necessary for the acquisition of electronic journals through a system called e-Deposit . After my internship with RDC I began working as an employee in OSI’s Integration Management office. My primary responsibilities are in the area of metadata remediation and management. I help develop metadata according to the new web framework guidelines for a variety of online content ranging from digitized materials to static web pages. Over the past couple of years, Integration Management partnered with the Interpretive Programs Office to migrate online exhibitions into a new web framework. An example of this work can be seen by looking at the Internet Archive’s version of Thomas Jefferson exhibit and the current online exhibit. The new framework allows users to access catalog records associated with digital objects, and creates page-level metadata that will refine the online catalog’s search capabilities. Side by side screenshots of the archived and current Library of Congress Thomas Jefferson Exhibition Home. In my personal experience, learning how to provide traditional library services (like reference services and cataloging) is important, but capitalizing on the opportunity to develop a technical background while in library school is equally as critical. The most valuable aspect of completing my graduate coursework was learning the principles of the profession, and becoming instilled with its values because the core mission of librarianship has not changed. As an emerging information professional, the most important theoretical principles are centered on becoming familiar with authority control in the digital age, the ability to manage and manipulate large sets of data, and understanding the challenges of preserving physical and digital formats. New librarians need to possess the ability to assess and describe collections like traditional librarians, but they also need to know enough about technology to successfully curate digital collections in the information age. While it is important to have this knowledge when entering the profession, it is equally as important to have had practical experience applying it. The experience you earn will not only prepare you for the workplace, but will give you an edge for applying the theory to practice. This is a syndicated post. Read the original at The Signal: Digital Preservation 2013-09-19.